Home / GST-Tally / TallyERP.9 Lessons / What is Stock Alternative units and How to use in Tally.ERP9? What is Stock Alternative units and How to use in Tally.ERP9? In this post, we know about Alternative Units and How to use this in Tally.ERP9? Alternative units is using to convert a unit in another unit or convert mega unit with total of sub units. For Example, A kilogram is a mega units and Grams is sub unit, Calculation of units is 1000 Gms = 1 Kg. Using of Grams and convert it into a Kilograms is perfect example of alternate units. Now we know how to activate alternate units in Tally.ERP9? Go to Gateway of Tally - Inventory Info - Stock Item - Create / Alternate, Press F12 for configuration and Select "Yes" to use alternative units for stock items. In above image, we create Wheat Inventory because wheat is perfect inventory to use alternative units. We create 1 Kgs. containing 1000 Gms or easily can be say 1000 Gms = 1 Kg. It means if we sold or purchase 200 Gms it means is is .200 Kgs. Create an Sales / Purchase Invoice and select inventory in your voucher. At the time of Item allocation for Wheat you need to enter quantity in Gms which will automatically be calculate in KGs. In above image, quantity of 300 Gms wheat entered and system automatically converted in 0.300 Kg. The formula of calculating alternative units is Gms / 1000 (KG) or reverse alternative units is Kg * 1000 (Gms). 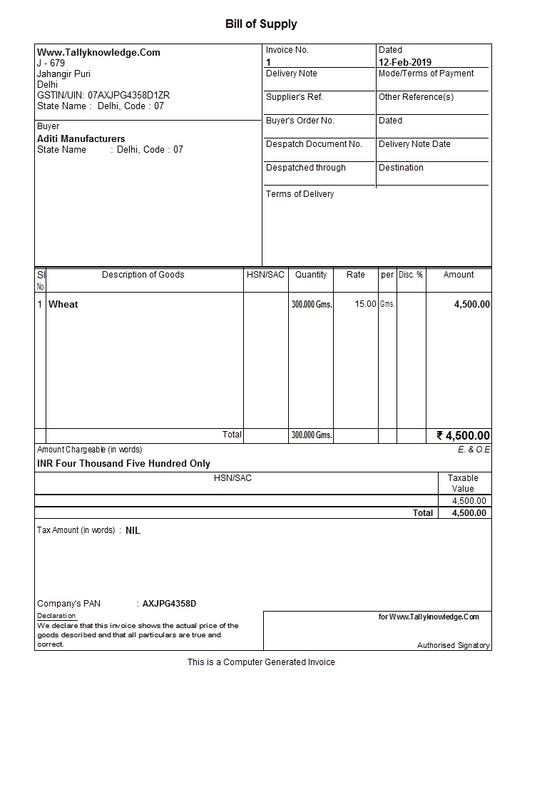 You can also print alternative or actual units in your invoice. Press Alt + P to print and Press F12 before printing the invoice. Configuration window will appear on your screen and select no to Print Alternate Quantity under Item Details and your invoice does not contain alternate quantity, only showing primary quantity.